San Diego home, beach resort home in Southern California. New on the rental market March 2015 after a complete remodel from top to bottom, front to back. Everything is brand new! This single family home (not a condo) sits on its own lot - no common walls or shared patio and it is literally a 30-second walk to the boardwalk and sand on the ocean, right in the heart of historic Mission Beach. One bedroom has a king bed and a flat screen TV. The second bedroom has bunk beds with a double and single and its own flat screen, too. The sofa-sleeper in the living room will sleep two more, so 7 altogether can sleep in beds. And there are two full bathrooms, one with a tub/shower, the other with a full-size shower. The kitchen is all brand new with a dishwasher, garbage disposal and beautiful counters and shelves.You can stay in touch and do some work with wifi and cable. How about parking? Yes, there are two designated parking spaces right across the street marked for your exclusive use. They are 25 feet from the house. The front patio has seating for outdoor dining with a great, brand new natural gas bbq. This house can be combined with the house next door for larger families or friends. 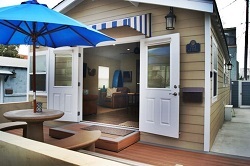 San Diego Beach Vacation Home Rental in San Diego CA..